Ciguatera and Lionfish – Should we worry? Ciguatera poisoning is caused by ciguatoxins produced by certain microscopic algae associated with reefs, can accumulate in certain fish species that eat these algae and can be life threatening when consumed by humans. Presently, efforts from CaribCATCH.org (a project consisting of 5 major institutions and the U.S. Food and Drug Administration along with the Schneider Regional Medical Center and the St. Thomas Fishermen’s Association) are being made to study ciguatera poisoning associated with changing environmental factors in St. Thomas. 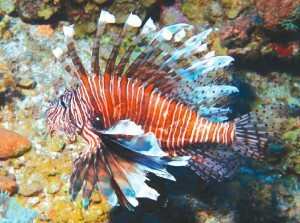 However, with the rapid increase of lionfish in seawaters, some concern has come up regarding the possibility of ciguatera poisoning associated with lionfish consumption. A short article on the incidence of ciguatoxins found in lionfish at the Virgin Islands was previously reported (click here to read more). Despite this recent information, no conclusive statements have been made about ciguatera poisoning associated with lionfish. Inconclusive information on ciguatera in lionfish may be a deterrent to one of the few tools that we have to manage with this particular invasive species: promoting its consumption. In Puerto Rico, lionfish has been promoted and eaten by local fishers. Puerto Rico Sea Grant provides information on how to process the fish safely and how to eat it based on local knowledge and experience (click here to read the Fuete y Verguilla Special Edition on how to prepare lionfish for human consumption). So far, no incidences of intoxication nor of ciguatera (which is perhaps a localized and seasonal occurrence) have been reported in the island. The USVI effort on the understanding of the environmental factors that may precipitate ciguatera are important indeed. However, the association between lionfish and ciguatera is only based on the possibility of the occurrence and a handful of fish sampled, but there is no information on ciguatera intoxication by consumption. We all must be wary, but also assertive on the possibilities of lionfish as a food source. Maljkovic, A., T. E. Van Leeuwen, and S. N. Cove. “Predation on the invasive red lionfish, Pterois volitans (Pisces: Scorpaenidae), by native groupers in the Bahamas.” Coral Reefs 27.3 (2008): 501. Schofield, P. J. “Geographic extent and chronology of the invasion of non-native lionfish (Pterois volitans [Linnaeus 1758] and P. miles [Bennett 1828]) in the Western North Atlantic and Caribbean Sea.” Aquatic Invasions 4.3 (2009): 1–23. Schofield, P. J. “Update on geographic spread of invasive lionfishes (Pterois volitans [Linnaeus, 1758] and P. miles [Bennett, 1828]) in the Western North Atlantic Ocean, Caribbean Sea and Gulf of Mexico.” Aquatic Invasions 5.Supplement 1 (2010): S117–S122. Johnston, M W. and S J. Purkis. “Spatial analysis of the invasion of lionfish in the western Atlantic and Caribbean.” Marine Pollution Bulletin Article in press (2011). Mumby, P J., A R. Harborne, and D R. Brumbaugh. “Grouper as a natural biocontrol of invasive lionfish.” PLoS One 6.6 (2011): e21510.